Isolated patellofemoral arthritis is not a rare condition. For the symptomatic patient, initial treatment begins with a nonoperative approach, including activity modification, weight loss, anti-inflammatory medication, physical therapy, bracing, and viscosupplementation. Surgical treatment for isolated patellofemoral arthritis is considered after an extended period of ineffective nonoperative treatment. Several procedures have been employed for isolated patellofemoral arthritis, including facetectomy, patellectomy, tibial tubercle elevation, and cartilage enhancement procedures such as microfracture or osteochondral grafting. 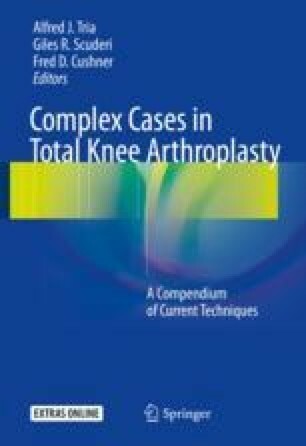 Isolated patellofemoral arthroplasty and total knee arthroplasty are considered in cases where joint-preserving procedures have not been successful. van der List JP, Chawla H, Zuiderbaan HA, Pearle AD. Survivorship and functional outcomes of patellofemoral arthroplasty: a systematic review. Knee Surg Sports Traumatol Arthrosc. 2015. https://doi.org/10.1007/s00167-015-3878-z. [Epub ahead of print]. The Swedish Knee Arthroplasty Register: annual report 2015. http://www.myknee.se/en/. Accessed 27 Jan 2017. National Joint Registry England and Wales: annual report 2016. http://www.njrreports.org.uk/downloads. Accessed 27 Jan 2017. Australian Orthopedic Association. Australian National Joint Replacement Registry Annual Report 2016. Available at http://www.njrreports.org.uk/chairmans-introductions. Accessed 27 Jan 2017.
van der List JP, Chawla H, Zuiderbaan HA, Pearle AD. Survivorship and functional outcomes of patellofemoral arthroplasty: a systematic review. Knee Surg Sports Traumatol Arthrosc. Nov 21. [Epub ahead of print]. http://link.springer.com/article/10.1007%2Fs00167-015-3878-z.